The mountain can be rough on the body and the bike, but with the Defender on your feet you get extra coverage that doesn't slow you down. Featuring a lightweight, durable Politex upper, Sidi uses strategic padding and rubber inserts for the protection that's needed for hard riding on the mountain. Down below, the new Outdoor Race sole features an optimized rubber compound on the outsole for extra grip. While the midsole offers increased stiffness for more aggressive terrain and riding. A Tecno 3 Precision ratchet closure system makes micro-adjustments of just 1mm for a precise, easy fit. 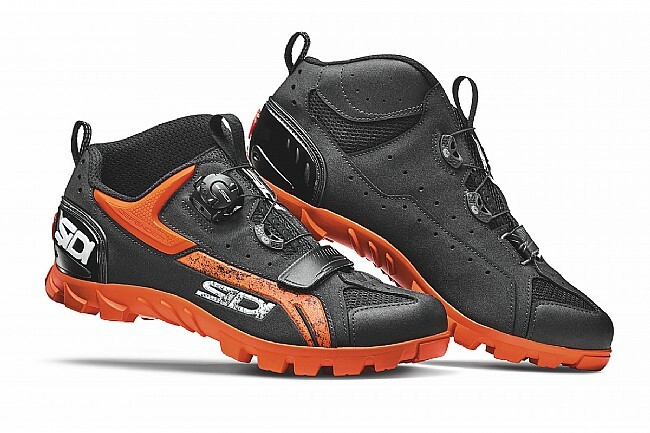 The Sidi Defender MTB Shoe is compatible with 2-bolt SPD-style mountain pedals and cleats. Politex upper is specifically designed for lightweight, comfortable durability. Upper design adds in added protection for the inner ankle without adding bulk. Sidi's Outdoor sole offers the perfect blend of stiffness and walkability. Grippy rubber outsole features optimally-placed studs for the absolute in walkability. Sidi Heel Cup provides pedaling stability and added security. Pull-tab on the heels allow for fast transitions. 4-holes plate for easy fitting of 2-bolt mountain cleats. Tecno 3 closure system provides fast, easy adjustments of as little as 1mm.